Qiao, H., Sun, T. (2014). Antibacterial activity of ethanol extract and fractions obtained from Taraxacum mongolicum flower. Research Journal of Pharmacognosy, 1(4), 35-39. H. Qiao; T.J. Sun. "Antibacterial activity of ethanol extract and fractions obtained from Taraxacum mongolicum flower". 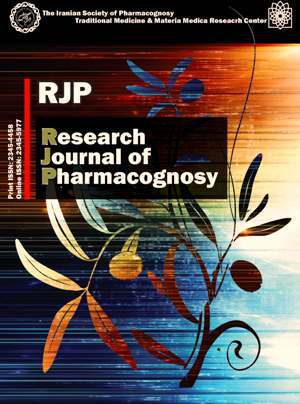 Research Journal of Pharmacognosy, 1, 4, 2014, 35-39. Qiao, H., Sun, T. (2014). 'Antibacterial activity of ethanol extract and fractions obtained from Taraxacum mongolicum flower', Research Journal of Pharmacognosy, 1(4), pp. 35-39. Qiao, H., Sun, T. Antibacterial activity of ethanol extract and fractions obtained from Taraxacum mongolicum flower. Research Journal of Pharmacognosy, 2014; 1(4): 35-39. Background and objectives: Resistance towards reveling antibiotics has captured great interest in evaluating the antimicrobial properties of the natural plants. Taraxacum mongolicum is widely used as a folklore medicinal plant for its diuretic, antirheumatic and anti-inflammatory properties. Though there are some reports on antimicrobial properties of Taraxacum mongolicum, studies on antibacterial abilities of its flower are limited and it was decided to evaluate the antibacterial properties of the flowers in the present study. Methods: The antibacterial properties of ethanol extract of Taraxacum mongolicum flower, and its fractions (petroleum ether, ethyl acetate (ET), and aqueous fractions) were examined through agar disc diffusion method, and the minimum inhibitory concentration (MIC) was determined. Four Gram-negative and two Gram-positive bacteria were used in the study. Results: The antibacterial test results showed that the ET fraction strongly inhibited the growth of all of the microorganisms, especially Pseudomonas aeruginosa and Bacillus subtilis (with MIC values of 125 μg/mL and 62.5 μg/mL, respectively), whereas the ethanol extract and the other two fractions demonstrated moderate and weak activities, respectively. Conclusion: The ET fraction obtained from Taraxacum mongolicum flowers presented high antibacterial activity and might be suggested for use as a natural preservative ingredient in pharmaceutical industries. Chen LF, Chopra T, Kaye KS. Pathogens Resistant to Antibacterial Agents. Med Clin N Am. 2011; 95: 647-676. Lou ZX, Wang HX, Lv WP, Ma CY, Wang ZP, Chen SW. Assessment of antibacterial activity of fractions from burdock leaf against food-related bacteria. Food Control. 2010; 21: 1272-1278. Ruban P, Gajalakshmi K. In vitro antibacterial activity of Hibiscus rosa-sinensis flower extract against human pathogens. Asian Pac J Trop Biomed. 2012; 2: 339-403. Martins S, Amorim ELC, Peixoto Sobrinho TJS, Saraiva AM, Pisciottano MNC, Aguilar CN, Teixeira JA, Mussatto SI. Antibacterial activity of crude methanolic extract and fractions obtained from Larrea tridentata leaves. Ind Crop Prod. 2013; 41: 306-311. De Las Llagas MC, Santiago L, Ramos JD. Antibacterial activity of crude ethanolic extract and solvent fractions of Ficus pseudopalma Blanco leaves. Asian Pac J Trop Dis. 2014; 4: 367-371. Schütz K, Carle R, Schieber A. Taraxacum-A review on its phytochemical and pharmacological profile. J Ethnopharmacol. 2006; 107: 313–323. Gao DM. Analysis of nutritional components of Taraxacum mongolicum and its antibacterial activity. Phcog J. 2010; 2: 502-505. Qian L, Zhou Y, Teng ZL, Du CL, Tian CR. Preparation and antibacterial activity of oligosaccharides derived from dandelion. Int J Biol Macromol. 2014; 64: 392– 394. Bauer AW, Kirby WMM, Sherris JC, Tvrok M. Antibiotic susceptibility testing by standardized single disc method. Am J Clin Pathol. 1966; 45: 493-496. Li HF. Extraction and purification of flavonoids in Taraxacum mongolicum inflorescences and their biological effects. M. Sc. Thesis. School of Pharmacy, Shanxi Medical University, Taiyuan, China, 2012. Saha S, Dhar TN, Sengupta C, Ghosh P. Biological activities of essential oils and methanol extracts of five Ocimum species against pathogenic bacteria. Czech J Food Sci. 2013; 31: 194-202. Nikaido H. Prevention of drug access to bacterial targets permeability barriers and active efflux. Science. 1994; 264: 382–388. Gao Y, Van Belkum MJ, Stiles ME. The outer membrane of Gram negative bacteria inhibits antibacterial activity of brochocin-C. Appl Environ Microbiol. 1999; 65: 4329–4333. Williams CA, Goldstone F, Greenham J. Flavonoids, cinnamic acids and coumarins from the different tissues and medicinal preparations of Taraxacum officinale. Phytochemistry. 1996; 42: 121–127. Shi SY, Zhang YP, Huang KL, Zhao Y, Liu SQ. Flavonoids from Taraxacum mongolicum. Biochem Syst Ecol. 2008; 36: 437-440. Yang L, Li HF, Diao HP, Tang XY, Peng TF, Sun TJ. Total phenolic acid content, total flavonoid content and antioxidant activity of dandelion flowers. Food Sci. 2011; 32: 160-163. Basile A, Giordano S, López-Sáez JA, Cobianchi RC. Antibacterial activity of pure flavonoids isolated from mosses. Phytochemistry. 1999; 52: 1479-1482. Xia DZ, Wu XQ, Shi JY, Yang Q, Zhang Y. Phenolic compounds from the edible seeds extract of Chinese Mei (Prunus mume Sieb. et Zucc) and their antimicrobial activity. LWT-Food Sci Technol. 2011; 44: 347-349. Eumkeb G, Siriwong S, Thumanu K. Synergistic activity of luteolin and amoxicillin combination against amoxicillin-resistant Escherichia coli and mode of action. J Photoch Photobio B. 2012; 117: 247-253.